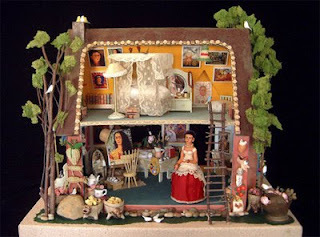 C ame across this amazing dollhouse when I was cruising around the web this weekend. 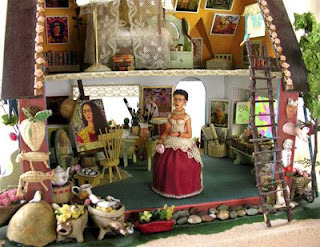 Elsa Mora of Los Angeles, CA, transformed Greenleaf's Sugarplum Cottage kit into Kahlo's studio to teach her daughter about the Mexican artist. 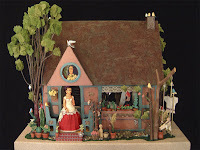 She also created the doll from polymer clay and fabric. 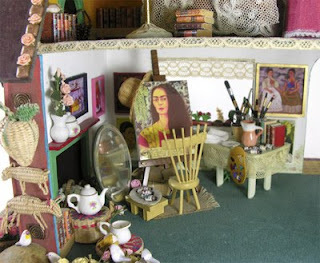 Frida Kahlo's Studio won an honorable mention in the 11th Annual Creatin' Contest at miniatures.com. Elsa, a native of Cuba, moved to Los Angeles in 2001. She is a multimedia artist who enjoys painting, ceramics, drawing, photography, installation illustration and papercutting. 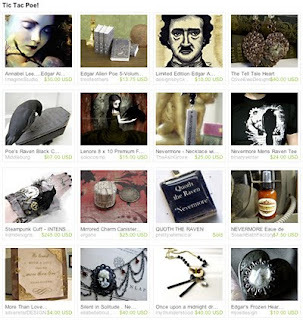 Etsy artist coccinellerouge's, of Rome, Italy, has put together a treasury of elegant Victorian Style and included my miniature Victorian book set! Coccinellerouge makes whimsical wool and felt accessories, be sure and visit her shop as well as the other Etsy artists featured in the treasury. 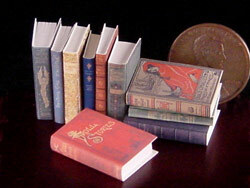 You can purchase the miniature "Victorian Collection" books on my website or in my Etsy shop! Well, I've made a few decisions about my miniatures business--there's going to be some changes around here! First and foremost, I have decided to finally put an end to the living nightmare that dealing with eBay has become, and am closing down my shop there. Between the expense, which just keeps going up and up, and the stress caused by their whole mess, it's just not worth it anymore. It's like working for the world's worst boss, who makes every day one of dread and anxiety, and has taken all the joy out of miniatures for me. So I'm done with it. Just making that decision makes my stomach feel sooo much better! It's exciting, too, because this will allow me to put more time and energy into my own website and blog, and on making more new items and handling commissions. I'm going to streamline my catalog of miniature books, focusing more on sets and less on the thousands of individual titles. While I do love being able to offer every book that ever was (yay books! ), it is, unfortunately, very time-consuming and unprofitable. Besides making the book itself, there's all the time spent photographing, writing about, adding to the website, etc. So I'll be consolidating many of the singles into sets. I'll still sell single titles on request, I'm sure, but I won't be listing them all individually anymore. 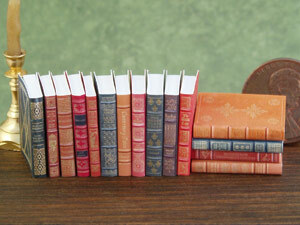 Thanks to Etsy artist Jessica Torres for including my miniature "Library Classics" book set as part of treasury collection near and dear to my own heart: "I heart books!" Jessica is a fine-art photographer who sells her vintage-inspired work on Etsy. 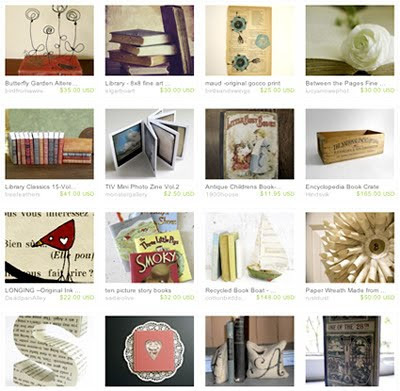 Check out her shop and take a look at the beautiful items she put together for the treasury - I really like some of the recycled art people are doing using old books. 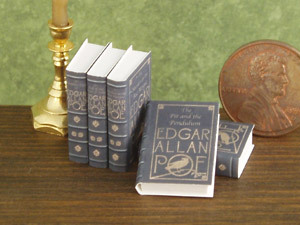 You can purchase my miniature "Library Classics" set on my website or in my Etsy shop! The new August edition of the free AIM miniatures magazine is now online! 145 pages packed with articles, miniature news, tutorials, and tons of other mini-related features, all brought to you by the members of Artisans in Miniature. 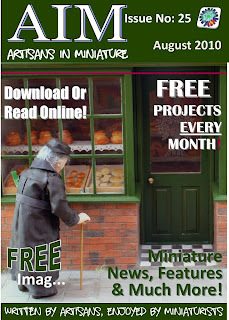 You can read this fantastic free online magazine at http://www.artisansinminiature.com.